As a business consultant providing direction and advice to both government clients and commercial clients, several topics continue to drive discussion not only on short term IT strategy, but also longer term innovative contributions cloud computing can offer the organization. However to get the conversation moving forward, managers contemplating major architectural change to their IT organizations need to find a good reference or pilot project to justify the expense and contribute to change. Not the preferred approach, but a reality. One easy IT project is the move from workstation-based applications, primarily office automation suites, to server-based applications. The choice is between applications hosted within a private (enterprise) network, or to outsource the application to a commercial provider such as Microsoft Live Office or Google Apps. If we look at profiles of most organizational users, the vast majority are office workers who normally do not need to travel, access files or applications from home, or stay on call 24 hours a day. Thus we can assume, while at the office, computers are connected to a high performance LAN, with high bandwidth and throughout within the organization. if that assumption is correct, and the organization implements either an enterprise-hosted or commercially-hosted (Google or Microsoft as an example), then those individual workstations can also eliminate keeping files on the local drives (can all be available and backed up to a file server), as well as using web-based applications for most activities. The user’s relationship with the network, applications, and intellectual property is channeled through a workstation or web interface. This also enables users, through use of VPNs and other access security, to use any compatible interface available when connecting to applications and files. This includes home computers and mobile devices – as long as the data is retained on the host file server, and a record is created of all users accessing the data for both security and network/computer resource capacity management. NOTE: As a frequent traveler I also spend a considerable amount of time in airplanes, airports, and areas without easy access to the Internet or my file servers. I do keep an image of MS Office on my laptop, and do have a very large hard drive, and do have a library of SD chips and flash drives for use when un-tethered from my web apps. I don’t see this changing in the near future – however I am probably in a very small minority of professional road warriors who still justify use of local images. Most do not. 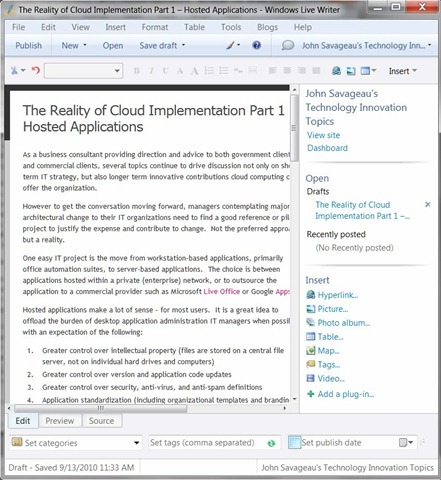 First, I am writing this blog entry using Microsoft’s Live Writer, a web/cloud-based application available for blog writers. it is one application available within the Microsoft “Live-Everything” suite of web-based utilities, which include office automation and social networking applications. The Live Writer application connects with my blog provider (WordPress), downloads my blog profile, and uses that as a what-you-see-is-what-you-get editing interface. I feel as if I am typing directly into my blog, without the need to understand HTML commands or other manual features. Adding video, tables, tags, hyperlinks, and SEO tools is effortless. Going further into my Microsoft Live Office account I can upload, download, create, edit, and store documents in all MS Office formats, with the main free apps including World, Excel, Powerpoint, and One Note. Mail, calendars, web sites, blogs – a variety of different utilities for personal and potentially professional use. It is easy to share documents, create collaboration groups, and integrate MS Messenger-driven conferencing and sharing among other connected colleagues. All available as a free environment for any user without the need to buy MS Office products for your personal computer. Other commercial products offer a lot more utility, however as a basic test environment, the performance of MS Live Office is more than adequate for probably 95% of office workers world wide. Face it, most of us rarely us anything beyond the most basic features of any office automation product, and purchasing licenses for individual office automation suites for each organizational user really only benefits the vendor. In my absolutely unscientific testing of both Google and Microsoft web-based applications, I did not find a single feature which I normally use in preparing presentations, documents, and spreadsheets that could not be reproduced with the online edition. If that is true for most users, then we can probably look toward a future where cloud-based and hosted office automation applications begin to replace software loaded on individual workstations. In a world of Service Oriented Architectures (SOA), and close inter-relationships of data, care is needed to ensure we do not create pilots “islands of unconnectable data.” Today, nearly all data is connectable, whether tables and forms within an email message, SMS messages, spreadsheets, data bases, or any other potential SaaS application. A word we need to keep in our IT vocabulary is “PORTABILITY.” Anything we type into an application is a candidate for logging, enquiry, statistics, reporting, or other use of data. This is a concern when using SaaS applications for not only office automation, but any other hosted application. Any and all data we create must be available to any other application which can consume or integrate organizational or industry community of interest applications. We will look into the SaaS portability question in part 2 of this series.